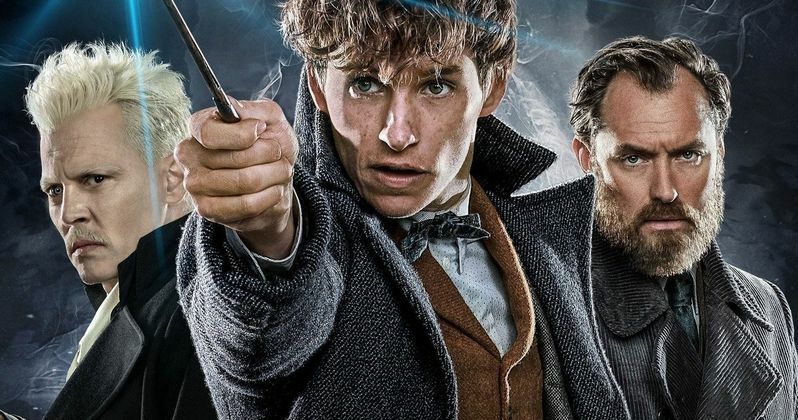 Fantastic Beasts: The Crimes of Grindelwald is red meat to the die-hard fans of writer J.K. Rowling. It will mystify everyone else. The film is a deluge of gaudy visual effects and wizarding world machinations. The near incoherent plot, a labyrinthine dive into the lore of the Harry Potter novels. Fantastic Beasts 2 is the middle part of an assumed trilogy. The cliffhanger ending so abrupt, it feels like the narrative slammed into a wall. The story picks up with Magizoologist Newt Scamander (Eddie Redmayne) in London. The Ministry of Magic has banned him from leaving the country after the capture of Gellert Grindelwald (Johnny Depp). Newt minds his mythical creatures, and rebuffs the attempts for help by his auror brother, Theseus (Callum Turner); who has become engaged to Leta Lestrange (Zoë Kravitz). Grindelwald spectacularly escapes custody. He travels to Paris with a singular purpose, finding Credence Barebone (Ezra Miller). Professor Albus Dumbledore (Jude Law) clandestinely visits Newt. He implores his former student, go to Paris and find Credence before Grindelwald. Newt doesn't understand why Dumbledore, the only wizard as powerful as Grindelwald, fight him instead. Newt changes his mind when he learns that Tina (Katherine Waterston) is in Paris. Circumstances reunite the old gang (Dan Fogler, Alison Sudol). Together they search for Credence, and try to uncover why he is so important to Grindelwald. Films in the Harry Potter universe are incredibly detailed. There's exposition a plenty, but a flow to the plot that grips the audience. Fantastic Beasts 2 is the first in the series to fail this standard. J.K. Rowling goes overboard. There's an onslaught of characters, critters, and plot development. Coupled with the nonstop special effects, the film becomes a blur. It's oversaturated, never slowing down to allow comprehension of the material. Rowling's novels are long. A reader can take a break, go back and review any points of confusion. This obviously can't be done on the big screen. Rowling needs a seasoned script editor to work with on the next installment. The less is more philosophy would have done wonders. Fantastic Beasts 2 is the sixth film in the franchise directed by David Yates. He's done a great job to this point, but finally stumbles with a cluttered product. The characters leap from scene to scene. Johnny Depp's Grindelwald is the only one given any time to develop. Then he drones on with tedious, grandstanding monologues. The waters are further muddied by the blinding effects. The wands conjure garish displays of light and sound. The mammoth action scenes devolve into bewilderment. Yates had a good run. It may be time to bring in new blood behind the camera. Fantastic Beasts 2 is a clear misstep. J.K. Rowling's vision turns into a jumble. The saddest part is the lack of intrigue. There's nothing magical about this film. Warner Bros. needs a fresh perspective for the sequel.